Our very first introduction to the world of Lynley Dodd and her marvellous creations came about six months' ago when J and I picked up Schnitzel Von Krumm Forget-Me-Not at the local library. There has been no looking back since. Our Lynley Dodd collection has grown from strength to strength. 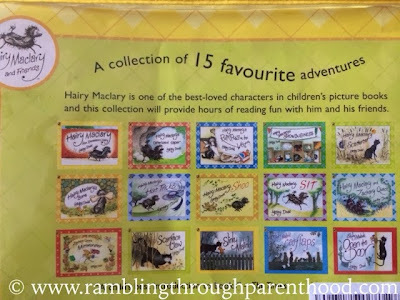 The latest acquisition has been a set of 15 books entitled Hairy Maclary and Friends. It came housed in a bright yellow-green plastic case with a zipper to keep everything neatly in place. An added bonus, when the new owner of these 15 books is a toddler as boisterous as the protagonist. There is a picture of Hairy Maclary and a couple of his friends on the cover. Looking like they have been up to no good. The essence of the collection, really. The entire C household has fallen hopelessly in love with the bumptious and bustly Hairy Maclary and his cheeky bunch of friends. And foes. For what would Hairy Maclary be without Scarface Claw, the toughest tomcat in town, to dog his every step. The usual suspects are there in force too. From Bottomley Potts, the dalmation, to Muffin McLay, an old English sheepdog, to Schnitzel von Krumm, a daschund. And the ever helpful Miss Plum, always to the rescue when any of her animal friends need it. We are introduced to Slinky Malinki, a feline version of Hairy Maclary, getting into as much trouble as her canine counterpart. And to Zachary Quack. Now who could have thought a tiny little duck could be such a monster! But there you have it. If Hairy Maclary can cause a rumpus at the Vet's and mischief at an obedience class, so can all his friends, big and small. The stories are easy enough for toddlers to follow. The characters are all very loveable, the language is simple, the rhymes flowing. The repetitive couplets only add to the charm. The illustrations are big, bright, colourful and very imaginative. And the plots are guaranteed to make you chuckle. The main character, Hairy Maclary is sure to strike a chord with any parent and toddler. He is almost toddler-like in his behaviour, always doing things he should not be doing, causing mischief, getting into trouble mostly of his own making, pretending to be really brave, and then running away like a scaredy cat when faced with the slightest bit of opposition. J has spent many hours poring over these books. They have really fired his imagination. He keeps an eye out for Scarface Claw when we go for a walk. He looks for 'Hairy Shoo' (as he likes to call him) behind every tree and under every hedge. Hairy Maclary and Friends are a continuing source of amusement to all of us. I thoroughly enjoy reading them aloud, perhaps as much as J loves listening to them. There have been times during a reading, when I have been completely carried away with my amateur dramatics. Only to find J giggling and joining in with a few of his own theatrics. I cannot thank Lynley Dodd enough for this brilliant, absolutely wonderful collection that has already brought us so much joy and will continue to do so for years to come. 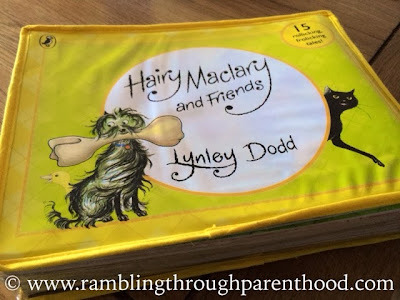 Disclaimer: The Hairy Maclary and Friends book set used and reviewed in this blog post was paid for and purchased by me. I was not offered any incentive or compensation to write this review. Remember the Mr. Men and Little Miss books we used to read? Maybe you can start him on those too. Not heard or seen this Author books. I will have a look next time! I love him, so funny. 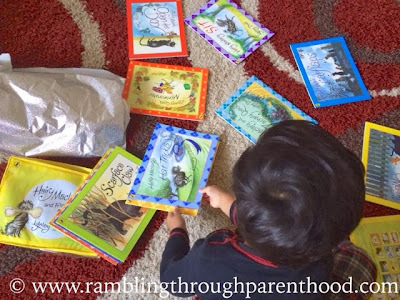 Great to find books kids love, it makes learning to read so much easier for them. I agree. If they love the book, they will want to read it. 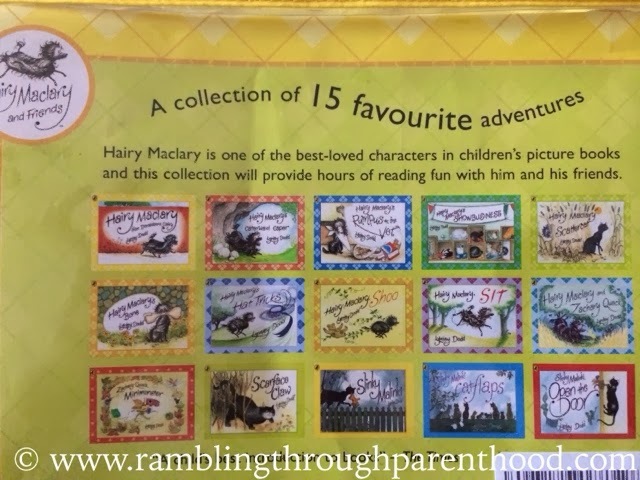 I love the Hairy McLary stories but for some reason my son hates them! He says they are scary?! Aww, poor thing! Is it Scarface Claw he is scared of? Try Forget-me-Not or Basketwork. They don't seem that scary. My pleasure, Charly. Am sure your little one will love these too. They are outrageously funny, aren't they? Completely adorable, I think. I am sure they will. They are fun for the grown-ups too! OH MY! I must buy this - I really must - Ozzy and Kitty are obsessed with Hairy McClary - we always used to come back from the library with nothing but those books! My 5 year old daughter would love these.We have a couple of Hairy books but a whole set would be lovely. We are yet to try out Hairy McClary. Must rectify that. Give him a go. Sure you won't regret it. My son used to adore that set when he was younger. We had all the stories on CD too, being read my David Tennant! Oooh, didn't know about the CD. Will have to look into that. Thanks for the tip Emily. Ooooh happy memories reading this - must get my kids into Hairy MacLary! I love reading them aloud too. Huge scope for am dram! You can't help loving him. I enjoyed reading the slinky malinky christmas cracker story over christmas and can't wait to read him the rest of the collection, this looks like such a great gift. We got it as a Christmas present for J. Money well spent. My children also love Hairy McLary!